Topseller: More than 175'000 m sold! A flexible metal band / Ferroband by MAUL with self-adhesive foam on the back side. The band can be cut to the desired length with normal scissors since it is only 0.15 mm thick. It also sticks to textured walls and is easy to install around corners. This metal band is available in 1,5 and 25 m length. Please note that magnets are not included in the delivery. This metal band works great for hanging up your postcards, event invites, photos, business cards, children's drawings, posters, etc. with magnets. Suitable magnets are linked under "accessories". Larger magnets will only attach slightly better because the metal band is too thin for this purpose. Attention: This is a self-adhesive metal band, not a magnetic adhesive band. 5 pcs. 0.46 CHF ea. 5 pcs. 0.58 CHF ea. The backside consists of a self-adhesive foam padding. Just cut (with household scissors), remove the foil, press on, finished. Caution: The foam padding adheres strongly to various surfaces and cannot be removed residue-free. 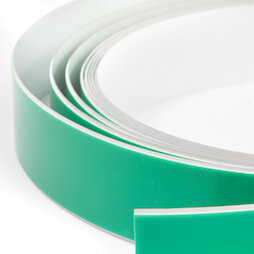 The self-adhesive metal tape also adheres to rough or uneven walls. The tape is not pure white. The colour is similar to Pantone 427C and pretty close to RAL 9018 (but not exactly). The metal adhesive band is a suitable surface for postcards, business cards, notices, cinema programs, photos, etc. Here an attachment with a flat disc magnet. No more pushpins and holes in the walls! You can also attach magnetic storage tins (from IKEA for instance) containing lightweight content with the metal tape. Don't have a goblin handy? Magnets can help!